Save £20 Off Holidays to Costa Del Sol! Save £20 Off Holidays to Costa Del Sol. With coupon code: AGP20. T&C’s: Minimum 3 nights. Book Now. Get £20 Off Holidays to Costa Blanca! Get £20 Off Holidays to Costa Blanca. With coupon code: ALC20. T&C’s: Minimum 3 nights. Book Now. Get £20 Off Holidays to Eygpt! Get £20 Off Holidays to Eygpt. With coupon code: SSH20. T&C’s: Minimum 3 nights. Book Now. Get £20 Off Holidays to Algarve! Get £20 Off Holidays to Algarve. With coupon code: FAO20. T&C’s: Minimum 3 nights. Book Now. Take £20 Off Holidays to Canaries!! Take £20 Off Holidays to Canaries. With coupon code: CAN20. T&C’s: Minimum 3 nights, Can only be used once per booking, must be entered at the time of booking, cannot be unsed in conjection with any other offer code. Save £25 OFF Holidays - Min 7 Nights! 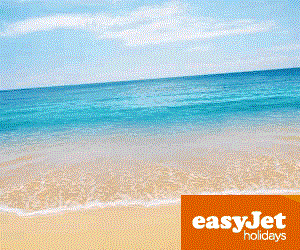 Save £25 OFF Holidays - Min 7 Nights, 2 Adults from easyJet holidays. With promo code: 25JUNEEASY. Book Now. Treat yourself to a City Breaks From £100pp! Book Now. All Inclusive holidays From £245pp! No Stress - All Inclusive holidays From £245pp! Book Now. Take £25 OFF on Holidays!! Take £25 OFF on Holidays!! With Promo Code: SUN25. T&C: Min 3 night stay. Booking Period from 25th July to 2015. Code Period: 24th June. Get £20 Off Holidays. Take £20 Off Min Spend £400, 7 Nights – Flight & Hotel. Use coupon code: EZY20OFF. City Breaks From Only £89pp! City Breaks From Only £89pp! Treat yourself to a weekend away in one of Europe’s fabulous cities. From a great value city break in Amsterdam to a cultural break in Budapest you’ll be spoilt for choice with these fantastic city break deals.Wine and dine over tapas in Barcelona or soak up the sun in the gorgeous Seville. There’s plenty of culture to be had in Rome while Berlin is a haven for those who are looking to indulge in a vibrant art scene. Couples who are looking for a slice of romance will never go wrong in Paris where a romantic walk along the River Seine never fails to impress. Families will love the a city break Prague where kids can enjoy delving into the rich history this fairytale town has to offer. Terms: City breaks from £89 per person is based on 2 adults sharing a room at the 4 star Grand City East in Berlin on room only basis for 2 nights departing Southend on 12th March 2014. Escape to he Beach! Book early and save with deposits – pay balance just 2 weeks before you go! Choose from some great holidays to the Algarve where you can soak up some sun on the beautiful beaches, or find yourself a quiet spot to unwind on a Majorca holiday. Book today and escape for less with a fantastic beach holiday deal. Terms: Deposits pay balance just 2 weeks before departure is applicable to holidays booked with the easyJet Holidays website and based on certain routes for specific travel periods and may vary. Deposit required at time of booking and balance payment of holiday must be paid 2 weeks before departure. All Inclusive Holidays From Only £199pp! All Inclusive Holidays From Only £199pp! Forget all your worries with an all inclusive holiday. Unwind as you enjoy dining, drinking and entertainment without any additional cost. With a variety of all inclusive options on offer there is an abundance of choice with free meals, snacks and unlimited alcoholic and soft drinks available. Many hotels provide free entertainment and activities throughout the day and well into the evening. Give your wallet a rest and grab an all inclusive holiday deal on the easyJet Holidays website. Terms: All Inclusive holidays from £199 per person is based on 2 adults sharing a room at the 3 star Clube Praia da Rocha in the Algarve on all inclusive basis for 7 nights departing Gatwick on 1 April 2014. Receive a Free Euro Currency Card with €50 Spending Money!! Receive a Free Euro Currency Card with €50 Spending Money!! Claim your €50 free spending money by entering code CASH50 when you book a holiday for travel between 1 May 2014 and 30 September 2014 on the UK easyJet Holidays website. Offer ends 31 January 2014. Laguna Park II Apartments Super Deal From £263pp! Laguna Park II Apartments Super Deal From £263pp! Playa De Las Americas, Tenerife, departing 24 Mar 2014 from Gatwick, Bed & Breakfast, 7 nights. Nieuw Slotania3 From £209.50pp! Amsterdam City, Amsterdam, departing 26 Oct 2013 from Luton, Bed & Breakfast, 2 nights. Grab an exclusive bargain break, with easyJet holidays. The easyJet holidays website pulls together great flights and hotels to give customers fantastic prices on holiday deals and provides holiday makers with a great range of flexible holidays at affordable prices. Choosing the perfect holiday is easy, with a choice of flights to over 27 countries from 13 UK airports and accommodation from over 100,000 hotels from 2* to 5*, self-catering to all inclusive. With low deposits from as little as £50pp on certain routes, customers can book now and pay the final balance just 4 weeks before they go! !